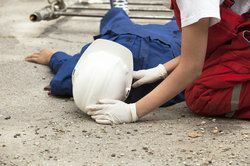 Of the numerous possible hazards that may exist within a construction site, nothing results in injury more often than a simple fall. In facts, falls are the number one cause of workplace fatality for construction workers across the country. These accidents need not be on roofs or scaffolding, however. Every year, between 25,000 and 50,000 workers sustain serious injuries just from falls from ladders. Despite detailed federal regulations on workplace safety, many Brooklyn workers still face the dire consequences of unsatisfactory precautions or oversight, particularly when it comes to ladder safety. Such construction accidents are not only hazardous to one’s well-being, but they can also carry long-term financial burdens for workers and their families. Rather than suffer the ongoing consequences of a ladder fall, seek the aid of an experienced personal injury attorney to be fairly compensated. How Do Ladder Falls Occur? According to the Bureau of Labor, 66 percent of ladder fall victims never received training on how to recognize a defective ladder. Coupled with the inherently risky environment of a construction site and the multitude of security measures that may be overlooked at any given moment, it’s not difficult to fathom how one could stumble from a ladder and become injured. Of all serious fall injuries by construction workers, ladders are involved over 80 percent of the time. These falls do not even have to be from a particularly high place to send workers to the hospital; more than one out of every five fatal falls occur from a height of six to 10 feet, and survivors are often left with severe injuries. In fact, this relatively low height accounts for a greater number of fatalities and injuries than any other height range. Potential injuries from a ladder fall include head trauma, brain damage, neck injuries, back and spine injuries, fractures, and more. The most common areas for injury are those in the lower extremities such as the ankles or legs, possibly limiting a worker’s ability to walk or perform necessary duties for a time. This inability to work will only add on to the financial difficulties created by hospitalization, doctors’ bills, and other services resulting from the accident. Ultimately, workers may be left with bills totaling tens of thousands of dollars, if not more, and missed wages on top of that. If you are the victim of a ladder fall, it’s important to examine the conditions of the accident and any external factors that may have contributed to it. If the ladder or an adjoining structure was somehow defective, you may have a case against the manufacturer via product liability. If the area or building was unstable, or you were uninformed of its actual condition, then the owner of the premises may be liable. For problems specific to the ladder’s placement, condition, or other issues of general supervision, the construction company itself may be held liable. Of course, you do not have to be certain of all of these factors yourself. Our expert personal injury attorneys will work nonstop to ascertain all available evidence regarding your accident. If there is any reason why your injuries were the result of someone else’s negligence, we will work with you to help you achieve full compensation. A single fall can set you or your family back years, financially. Don’t wait to consult one of our attorneys on your recent accident. Call or email our office at your convenience to learn more about how we can assist you.